The best thing about the holiday season must be all the lovely leftovers. Cooking in bulk and re-heating stuff for days after – in new combinations. Quick, easy and tasty! Still, sometimes I just feel like a fruit salad or a yoghurt instead of a big meal. 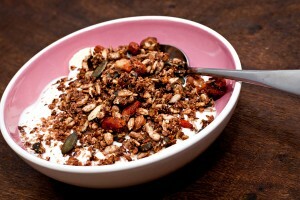 And I want muesli with that. 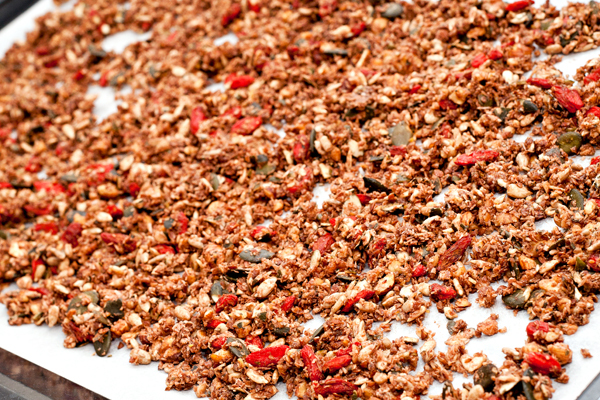 Our last batch of Christmas Muesli was gone, and to be honest – I don’t feel very Christmassy any more. But chocolate, oh – any day is a chocolate day! 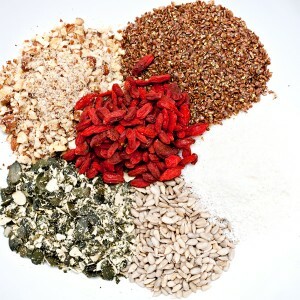 100 ml (0.4 cup) goji berries – leave out, or substitute with other dried berries, if you don’t have goji. I just happen to be hooked on them right now…. Stir until completely mixed and spread on a baking tray.